At BGS, we have a holistic, time-tested approach towards optimizing organizations. Through our five-step BGS Business Optimization Process, customized for each client and engagement, we take a deep-dive into an organization, assessing its specific needs and goals and mapping out a plan to help the business operate at optimum. to begin, we meet with key leaders and stakeholders of an organization to obtain a solid understanding of the business, its current state, its future goals, and the areas that could most benefit from our guidance. We also document the ‘as is’ conditions of the business to later use as a baseline for an optimization roadmap. We continue to meet with the organization’s leaders throughout the engagement to ensure that expectations are being met, goals are consistently aligned, and that feedback is continuously integrated. 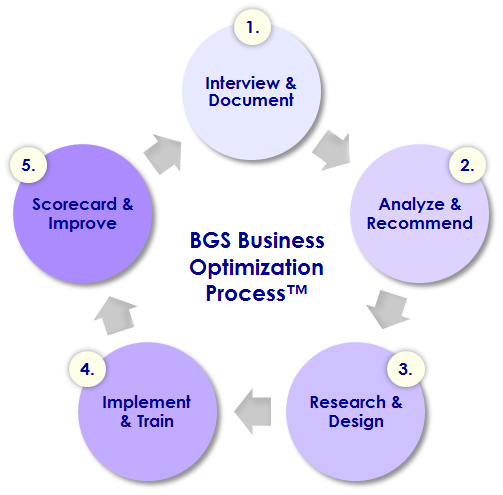 Importantly, the BGS Business Optimization Process should be seen as a continuous and multi-dimensional practice. Our dedication to the optimization of businesses means we are constantly looking for ways to make an organization more efficient – accordingly, we may go through this process multiple times during an engagement as we uncover more ways in which a business can OPERATE AT OPTIMUM.